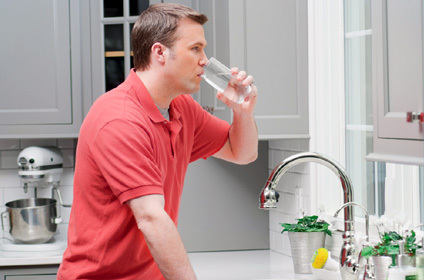 Drinking Water – Commonwealth Water Treatment, Inc.
Systems specifically designed for drinking water are often used in the kitchen where people want the healthiest, best-tasting water for drinking and cooking. Depending on the type used, they not only improve the taste but also can remove odors and other contaminants. But bringing all the water in the home up to high-quality drinking water standards is unrealistic, expensive and quite frankly, unnecessary. That’s why most drinking water systems treat the water and dispense it from a specific tap or device. Recognized by the Centers for Disease Control and the Environmental Protection Agency as an effective means for treating drinking water, reverse osmosis systems process water by using pressure to force the water through a very fine, semi-permeable membrane. Usually, RO systems are comprised of a prefilter, a membrane and a postfilter, although some also offer various advanced filtration options. In the RO system, the prefilter removes larger particles from the water before it travels to the membrane. Then, the water is forced through the membrane, leaving behind the impurities that were in the water. Since the process takes time, a small tank stores the purified water until it’s needed. But before the water is dispensed from the dedicated faucet, it runs through a postfilter to remove any remaining tastes or smells. Water produced via reverse osmosis very nearly reaches the purity of distilled water but in a much shorter time and without using any electricity. The Reverse Osmosis TX Membrane System is a saltless whole house solution for solving a variety of water problems. Carbon filters remove chlorine and unwanted tastes and smells from drinking water, but that’s primarily all they do. Simply put, the water passes through a bed of carbon that adsorbs any chlorine, unpleasant tastes and odors. There are various types of carbon filters available: pitchers, under-the-sink or countertop models, faucet mounts and those found in refrigerator water dispensers. The type that is right for you will depend on your need for water, what you want to remove from your water, the feasibility of installing the filter, the amount of filtered water you need, your desire for convenience and your budget.